This may not be one of my better drawings, but for sentimental reasons it is one of my favorites. I have a thing for stars. This came to my attention a few years ago, as I was pinning images to my Pinterest boards, and I noticed that I had been inadvertently collecting images of stars, quotes about stars, and just about anything and everything star-related (and so I started a new board dedicated to stars). I also became aware of how I doodle stars on my papers and use stars as bullet points in my notes or when I encounter favorite passages in the books that I read. I like the geometric shapes that we call stars as well as the celestial ones. I like the words we use to describe stars like bright, shiny, and shimmery. I like how stars symbolize our destiny and how we refer to them when we tell our stories. I like that stars are universal. I like saying stars in Spanish, las estrellas. Stars just make me happy. 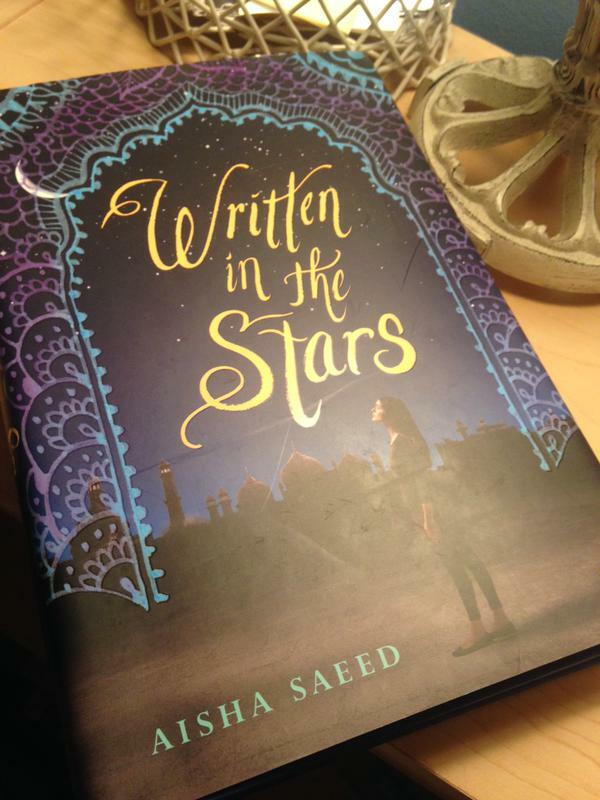 When I received a copy of Written in the Stars by Aisha Saeed, I, of course, immediately felt a connection to the book because of its title and moved it up the reading cue. (Let’s face it, when there are many unread books on our shelves something has to make us want to pick one of them out from the crowd.) Enticed by the questions on the book’s back cover — Has Naila’s fate been written in the stars? Or can she change her destiny? — I was curious to find out the role that stars would play in Saeed’s book. In this story, the life of a young woman named Naila is completely turned inside out. Like many American teenagers, Naila and her parents don’t always agree about what is best for her. As she comes of age, makes friends, plans her studies and future career path, and falls in love, her interests and her family’s traditional Pakistani beliefs clash terribly. The conflicts in the story unfold through Naila’s naive eyes. She is spirited and gentle; we feel joy and confusion along with her. Then later we feel incensed and terrified as she tries to understand the actions of the other characters and all of the decisions being made for and around her. We experience traditional Pakistani culture as Naila’s family teaches the many facets of the traditions to her and she is torn between embracing the traditions and the family she loves or following her own heart. Ultimately, Naila’s family’s traditional ways overpower her free will, and she finds herself trapped in a country and a marriage she does not choose — or know how to leave. I was filled with such strong and conflicting emotions from early on in the book, that I had to read it all in one sitting. As I read, I both wanted Naila to be happy, and I wanted the other characters to be happy as well. I wanted Naila to stay, and I wanted her to flee. I wanted Naila to understand her parents, and I wanted them to understand her. I wanted Naila to love and to be loved. Through her own understanding of the way things are and the way she would like them to be, Saeed tells a story that successfully weaves together all of these dichotomies. Saeed creates authentic and relatable characters for whom we want to cheer on, while she simultaneously keeps true to the notion that some things are predestined. By the end of the emotional journey through the book, I was ready for whatever the stars had in store for Naila.